A MakerBot Innovation Center is a serious commitment to 3D printing. With it, a university can provide unique opportunities for students, faculty, and the community that would be impossible or very difficult to create otherwise. Those might include campus-wide access to 3D printing, a centralized hub for STEAM learning, cross-departmental collaboration, stronger relationships with local entrepreneurs, and regional notoriety for the university. Take a look at any university with an established MakerBot Innovation Center and you’ll find living proof. For university educators and administrators out there, even if you’ve already decided that you want a MakerBot Innovation Center, you will still need to fund it. Since that funding process can vary greatly between universities, it isn’t always easy or straightforward to navigate. As a result, MakerBot is proud to offer Strategies for Funding a MakerBot Innovation Center at Your University. This white paper investigates and analyzes the funding process at universities with a MakerBot Innovation Center through six case studies. As you’ll see, no two case studies are alike; however, there’s plenty that you can take and apply to your own funding situation. Through this white paper, you will learn the following: • Common scenarios that more easily lead to success • How to pitch to your Procurement Department • The importance of executive sponsorship • The key drivers in each university’s funding story • Potential funding options You can download this white paper here. This white paper is part of an ongoing effort to provide better support for 3D printing on campus and in the classroom. Other materials are available at the MakerBot Education Resource Center. About the MakerBot Innovation Center MakerBot Innovation Centers empower your organization to innovate faster, attract talented students or staff, increase collaboration, and compete more effectively. A MakerBot Innovation Center is a centralized, scalable 3D printing hub with large clusters of MakerBot Replicator Desktop 3D Printers. It is a customized solution that includes 3D printers and installation, the proprietary MakerBot Innovation Center Management Platform software, training, support, specialized racks, and filament. 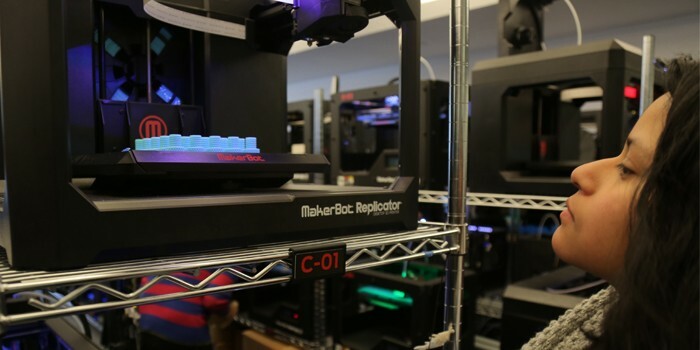 Learn more about the MakerBot Innovation Center.